I'd like to take the next three posts this week to review C. Kavin Rowe's great book World Upside Down: Reading Acts in the Graeco-Roman Age. I'd like to introduce you to Rowe's book because a lot of us are very interested in reading the bible against Empire. But if you want to do this you need to be aware that there is a way of reading the book of Acts, a reading that has achieved something of a consensus among many NT scholars, that mitigates against reading the bible as an anti-Empire polemic. In World Upside Down Rowe investigates that consensus view and finds it distorting and lacking in various ways. Though, to be sure, there is something that needs to be addressed in the consensus view regarding the relationship of the early Jesus movement and the Roman Empire. Consensus views in NT scholarship don't end up being consensus views for no reason. There is something in the book of Acts that anti-Empire Christians need to wrestle with. Rowe's World Upside Down will help you do that. So what is this consensus view? The consensus view is that Luke wrote Acts to calm the fears of the Roman empire--onlooking Roman neighbors and the Roman state--as the Jesus movement spread and grew more numerous. Wary of a violent backlash, and perhaps in the beginning throes of it, Luke pens a narrative to show that the Empire has nothing to fear from Jesus and his followers. Acts is a letter to Rome that basically reads, "Dear Empire, you have nothing to worry about." King Jesus is not a rival for Caesar's throne. 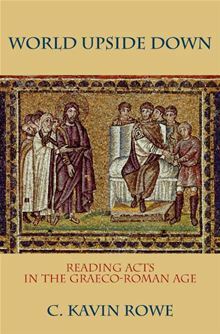 Without question, the dominant trend in NT scholarship has been to read Acts as a document that argues for the political possibility of harmonious, coeval existence between Rome and the early Christian movement. If you read the bible (at least partially) as an anti-Empire polemic and say things like "Jesus is Lord and Caesar is not" then this consensus view is worrisome. Does the state have nothing to fear from King Jesus? Is Christianity politically innocuous and inoffensive? Is that what Luke was trying to say in the book of Acts? To evaluate this reading of Acts we need to look at the evidence that supports the consensus view. That's what I'd like to do in this post. Tomorrow we'll turn to the evidence Rowe reviews in Luke/Acts that pushes back on this reading. To begin: Why is it argued that Luke was seeking to show that the Jesus movement was politically inoffensive to the Roman Empire? Beyond Luke/Acts having a generally favorable take on Roman centurions (cf. Luke 7.1-10, 23.47; Acts 10), it mainly has to do with the final chapters of Acts. After his arrest in Jerusalem in Acts 21 the narrative parades Paul before a series of Roman officials who offer official Roman assessments of the Jesus movement. It starts with Claudius Lysias (Acts 23), goes to Felix (Acts 24), and then to Festus (Acts 25). We could also include Agrippa (Acts 26) as a Roman surrogate. "I found that the accusation had to do with questions about their law, but there was no charge against him that deserved death or imprisonment." "I found he had done nothing deserving of death, but because he made his appeal to the Emperor I decided to send him to Rome." Based on this evidence--that in the book of Acts the Christian movement is repeatedly vindicated in the eyes of Imperial Rome--it is argued that Luke is wanting to show that the Jesus movement is politically inoffensive and innocuous. It is argued that Luke is wanting to show how confessing "Jesus as Lord" poses no political threat to Caesar. So that's a sketch of the consensus view. But is it correct? Is it too simplistic a political reading of Acts? Is it missing something? We turn to those questions in the next post. Many learned articles have been written, especially by Jewish scholars, pointing out that one of the gospels prime aims was to explain away Christ's execution for treason/insurrection by the Romans. The evangelists go to great lengths to circumnavigate a difficult problem: If his dispute was only with the Jewish authorities why was he not stoned for blasphemy? Under Roman law, the Jews could not exercise the death penalty. Hence the reason why Jesus was taken by the Jewish leadership before Pilate. In John's Gospel, Pilate even says to the Jews, "Take him yourselves and judge him according to your own law" and they reply "We are not permitted to put anyone to death." @AlanCK:disqus If the Jews could not exercise the death penalty (a view I have heard and accepted many times)....how come they could stone Stephen? Good question. Clearly an extra-legal zealous act in the case of Stephen. But there would not have been a social equivalency between Jesus and Stephen. The risk involved with stoning Jesus would have been much greater for the Sanhedrin. I'm not sure that there's any hard evidence of local leaders really being unable to execute their own people in Roman provinces throughout the empire. Though that of course would not extend to the killing of Roman citizens. The crucifixion of Christ points to his being regarded as a threat Roman hegemony. Rowe in his book actually covers this matter quite well. Roman law and its administration throughout the empire was affected by the sort of administration and by who was the administration.